Spacious well appointed self catering property with lovely views. Sleeps 8. This property has a 4 star Visit England grading. It has a fitted kitchen with electric oven, hob, extractor hood, dishwasher, washer/dryer, microwave, toaster, CH boiler, fridge and separate freezer. The ground floor is open-plan with large living area including wood burning stove to Inglenook fireplace. There is a separate dining area seating 8 around a large table. There is also a shower room on the ground floor. An imposing staircase takes one to both sides of the property with viewing bridge. The large impressive master bedroom has a wealth of original oak beams, king size bed, ensuite shower room and walk-in wardrobe. Across the bridge there are two attractive bedrooms and a bathroom with bath, shower enclosure and shaver point. Further stairs lead to a 4th bedroom with twin beds and a separate galleried landing area with seating, TV and DVD. Access to the gravelled parking area to front and private lawned garden with flower borders to rear is via a covered verandah. This property has a ground floor shower room with shower enclosure for use when returning from outdoor activities. There is a fully tiled bathroom with bath, shower enclosure and shaver point to first floor which is next to bedrooms 2 and 3. The Master bedroom has its very own ensuite shower room with shower enclosure and shaver point. Children - We would point out that the property has many stairs and a high level gallery so it is very important that toddlers and young children are properly supervised at all times. For the comfort of guests this property is non-smoking. As a group of very dear friends, we have been enjoying weekend breaks throughout the country for almost 20 years and The Old Orchard Barn must be one of the best we have stayed in. It was stunning to look at and the location was perfect with beautiful views over the countryside. The welcome hamper was a very thoughtful touch and it set the scene for the rest of the property. We wanted for nothing, plenty of equipment and beautifully clean. We didn't get a chance to meet Claire but we had no need to except for passing on our compliments and thanks. We can fully recommend this wonderful property to all. P.S. Thank you so much for leaving the property so very tidy; it really helps! Lovely place to spend time with the family celebrating our Golden Wedding Anniversary. Excellent location for country walks, first class accommodation, everything you need supplied and even an introductory tour and welcome basket. Our stay at Old Orchard barn was most enjoyable. The barn was very clean and comfortable. We were able to take advantage of the fabulous countryside enjoying walks by the nearby River Monnow. Old Orchard barn is a super family property with plenty of space to relax. Our lovely welcome hamper was very much appreciated. A perfect home for our Christmas celebrations with our family. I would like to thank my recent guest for her 5 star review. I am very pleased to hear that their Christmas was so enjoyable. The walk by the River Monnow is one not to be missed - one can walk as far as the church or on to Skenfrith. I am also very pleased to hear that the welcome hamper was a hit. Thank you once again for your complimentary comments. You would be very welcome to stay again, at any time. We had our annual family get together in Claire's beautiful barn conversion. The barn greats you with the wow factor - a three floor galleried staircase.It is well furnished and has plenty of space for 8 adults. The kitchen is very well equipped with everything you might need to produce great food. The long dinning table was a delight with more than enough room for us all to us all in comfort. Although the barn was more than warm enough without it, we enjoyed sitting around the log burner in the evening. We have already been recommending the property to friends and are thinking of a return when better weather would enable us to explore the fabulous setting a little more. I am so pleased you enjoyed your stay at Old Orchard Barn and your comments are much appreciated. We do a lot of self-catering holidays ourselves and we try very hard to provide everything we think our guests would need to make their stay comfortable. Thank you so much for recommending us to friends. If you wish to stay again, at any time, you would be very welcome. We loved the barn and the peaceful surroundings, though I'd suggest driving there in light as the narrow lane can be a little surprising. Everything was provided to us, including lots of helpful information. Only thing missing was something that has nothing to do with the property: a convenient local pub! We gamely walked the four miles into Monmouth for that! I would like to thank my recent guest for his complementary five star review. Sorry about the pub not being local but there are a large number to choose from in Monmouth or some very nice ones in nearby villages, such as The Bell at Skenfrith or The Moon at Garway. It is very quiet and peaceful in our part of the Monnow Valley which is why Old Orchard Barn is the ideal place to get away from it all. If my guest would like to stay again at any time in the future he would be most welcome to do so. Lovely barn conversion spacious clean lots of character. Would recommend . Home from home. Plenty of amenities and full of character. Spacious, clean roomy. Tastefully decorates. I would like to thank my recent guest for her 5 star review and for her complimentary comments. I hope the golf went well. Please do recommend us and do come again. You would be very welcome at any time. 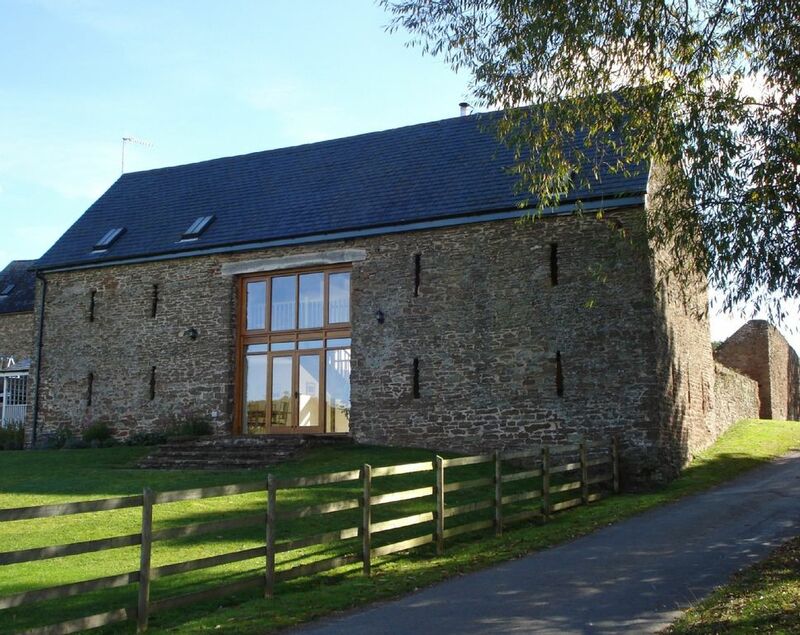 This converted Grade II listed 18th Century stone threshing barn is situated 4 miles from the historic border town of Monmouth, in the picturesque Monnow Valley. Monmouth, the birthplace of Henry V and Charles Rolls, is in the Area of Outstanding Natural Beauty known as the Wye Valley. Close by is the beautiful Royal Forest of Dean. The Cathedral City of Hereford, on the River Wye, home of the Mappa Mundi and Chained Library(www.herefordcathedral.org/visit-us/mappa-mundi-1), is about 16 miles to the North and Ross-on-Wye, the birthplace of English Tourism, is some 10 miles distance. The Black Mountains and the Brecon Beacons National Park are within easy reach for the enthusiastic walker, with Brecon and its Cathedral close by, less than an hours’ drive away. The Glamorgan Heritage Coast, Cardiff Bay, Swansea and the Gower Peninsular are also within easy reach for glorious days out. There is some beautiful local countryside surrounding this barn with lots of footpaths and many walks. En-route there are some lovely country pubs and fine restaurants, eg The Bell at Skenfrith (award winning). HUMBLE BY NATURE - BIG DAY OUT at Humble by Nature, Penallt, Monmouth NP25 4RP (Kate Humble) - www.humblebynature.com Dates for 2019 not available yet. COLEFORD MUSIC FESTIVAL -13th & 14th July, 2019. Coleford Town, Forest of Dean, Gloucestershire. www.colefordmusicfestival.co.uk. CHANGE OVER DAY FOR WEEKLY BOOKINGS IS SATURDAY 30% DEPOSIT PAYABLE ON BOOKING BALANCE PAYABLE SIX WEEKS PRIOR TO ARRIVAL CHRISTMAS = 21st to 27th December, 2019 (6 nights) NEW YEAR = 28th December, 2019 to 2nd January, 2020 (5 nights) PRICES INCLUDE BED LINEN, TOWELS, TEA TOWELS, ELECTRICITY, CENTRAL HEATING FUEL AND A STARTER KIT FOR THE WOODBURNER.